Waiting to be served at our local butchers for “home-made” beef, and hopefully horse-free, burgers gave us the opportunity to study the array of “unmentionable” delicacies on sale. The dubious identity of which even made Mr. Piglet’s toes curl in horror. However, our debate is quickly forgotten when I whip out my camera and start taking photographs. 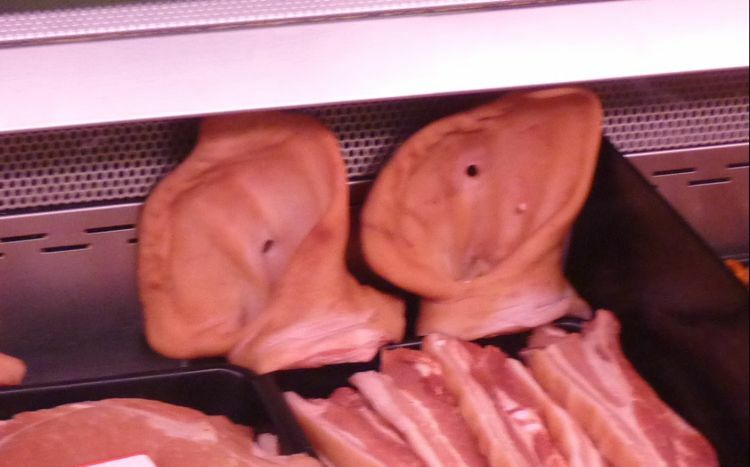 Mr. Piglet looked like he was about to evaporate with embarrassment while the surprised butcher and bemused customers looked on. Yes, I know I’m strange it runs in the genes. I mean, what are they? I wonder if I’ve ever eaten any inadvertently since living in Portugal – my trotters are already twitching in horror. People ate horseburgers in the UK without knowing so why not rabo porco in Portugal? Can you imagine the uproar in the UK if burgers were found to contain these little beauties? Eating horsemeat would be the least of their worries! 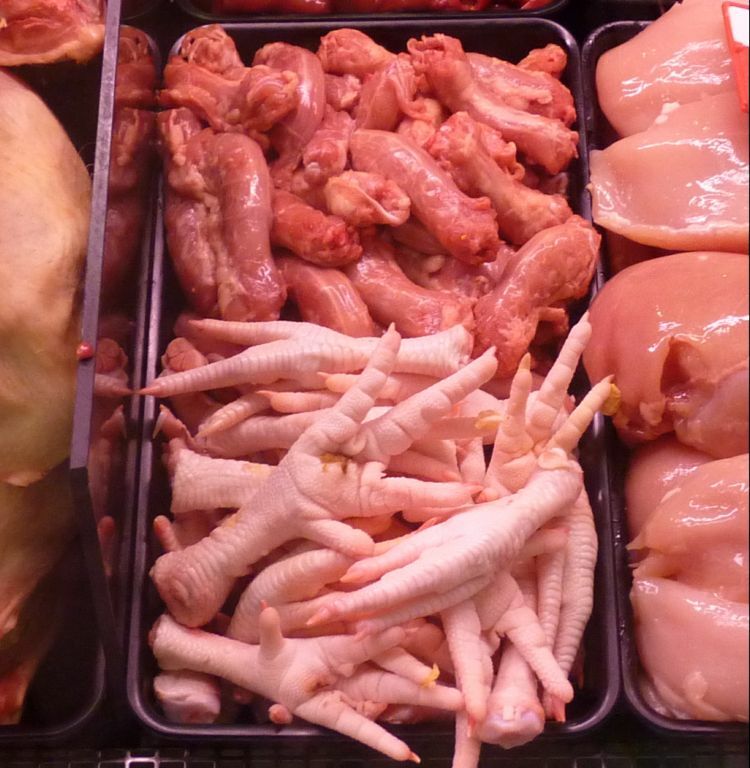 And finally in my rouges gallery of food horrors I present chicken’s feet and chicken’s whotsits. Not sure which part of the chicken whotsits belong to, and to be honest I’m not sure I want to. I wonder if you manicure chickens’ toenails before you cook the feet? Perish the thought – otherwise I suppose it must be similar to finding a fish bone in your mouth. Is it me or am I the only one who’s squeamish? Yes, I am seriously considering the idea of cutting meat from my diet. Oh my God, that was nasty. Lol. Here in San Antonio in the Mexican meat markets, they sell pig’s heads, especially at Christmastime, for making tamales, since the meat from the pig’s head is supposed to be the tenderest. I think those other chicken things are necks, at least that’s what they look like to me. My mother used to use them for soup when they were packaged with the liver and gizzards inside the chicken. They don’t anymore here, but they still do with turkeys. thanks Angie and welcome. The more I look at these photographs the more I have problems coming to terms with eating meat. These are definitely an argument for becoming a vegetarian! as for inadvertently eating some of the thingies, I suppose they would be proud to display it as is..
Hi Ianna, I think these bits are sold pretty widely acrossEuopre. I supes in the UK where I lived they were not that popular, so I was never exposed to them…or them to little miss squeamish! Love the thought of Rabo bank. I’ve since learned rabo is tail so porco rabo is pig’s tail! I almost wanted to become a vegetarian looking at those pics, especially the first one. That’s why I’m not too keen on eating sausages. Blah! I suppose a bit like the pies at “Sweeny Todd” the barber! Hi Alice…to be honest I’ve never seen such a selection of unmentionables in such a counter small space! Ugggg! Carole, I’m glad I don’t eat pork! Thankfully when I lived in Portugal my butcher didn’t have such a disgusting display, it would put me off meat altogether even though I’m very choosy with the meat I eat. Yes, Ioana, I too have seen a Rabobank here in Sydney and even took a photo as I thought it was quite funny. It was also a major Ugggggg from me as well because there were so many unmentionables it was indeed a foodie gourmet sight to behold. Anyone who likes them must have thought it was Christmas! I’m also very choosey what I eat 🙂 BTW please thank your Mum for dropping by my blog. A big YIKES on this side of the line. 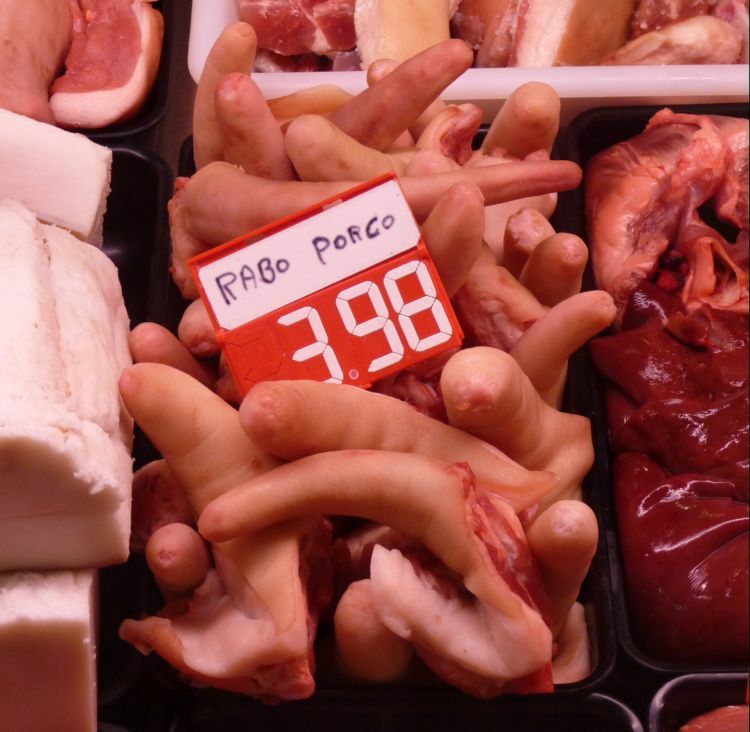 I have seen those chicken feet live when I was in Portugal… and just had to look away. And then the pig’s head? I would be screaming in/at that butcher! YUK – YUK – YUK! Ok, people, calm down. You can have oxtail but not (first pic) pork tail (rabo de porco)?! And it’s chicken necks in the last pic. Have you never been on a farm? Guess not. PIP I am so glad I saw your post after brunch…considering we had pork sausage and bacon….LOL! Geesh they look like real hands! Hi Alpine, yep at just 3.98 a real snip…pardon the pun 🙂 I wonder if there is much meat on them! Haha I enjoyed this! In the DR meat does not come in nice plastic packaging. We eat chickens feet, with nails, pig snouts and feet too. Tripe is a favourite and if you order goat it comes with head fur and hooves. Def time to go vegetarian. [laughing] Seeing my name I think you’ll remember it from last time and know what is coming! 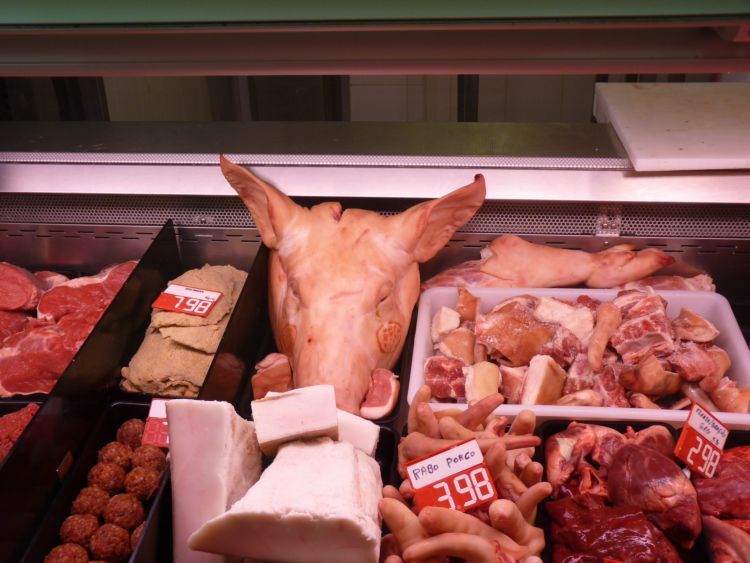 Pig’s heads are used throughout Europe methinks; they make the most beautifully gelatinous brawn amongst other things. and are great both for stock and roasting surely. Beautiful braised chicken legs are available in most Chinese restaurants here and are absolutely scrumptious, even if a bit fiddly to eat. The pigs’ tails I thought were actually pigs’ penises: don’t recall who of you published a delightful stew recipe for it just recently: mine are still on order with the local butcher! But dryrubbed and roasted tails surely would make a delightful change? 🙂 ! Methinks some of you miss the best bits!!! Hi Eha, LOL . ewww I could not boil up a pigs head. Can you imagine it’s little blue eyes staring back at me…no way. I’d feel like a cannibal. But fish eyeballs are for the honoured guest at any of our dinner parties! Depends on the size; I have had some somewhat slippery trying to escape from your mouth:) ! I almost don’t dare to ask; you DO eat beef tongue, don’t you? Have one cooking for some guests for tonight! Parsnip mash and fresh horseradish sauce! Rugola salad etc et al . . . Make that at least once a fortnight in spite of relatively high cholesterol levels . . . best part of the cow bar the honeycomb tripe . . . Never ever had anyone less than enthusiastic!!!!! Much softer than any chop or steak and heaps more tasty! And leftovers marinated cooked in a garlicky French dressing: pure heaven!!! Hmmmm I’ll take your word for it! My grandmother raised her own chickens and always threw the feet into the pot of stew, dumplings, whatever. They weren’t to eat, but for seasoning. Lately, it has been discovered that the curative powers in the chicken – we’ve all heard of chicken soup for the cold or flu – lies in the feet! Grandma was right! Hi fee, I wonder if Mr P would notice next time he had a cold if I served him chicken feet stew 🙂 Even sitting here writing this, I am cringing at the thought. Look at their feet they look like human hands! I think they are chicken necks in the container with the chickens feet. At one time when you bought at chicken, the neck was inside, to use or not to use depending on your palate. Raw chicken necks are good for dogs. Don’t know if I’d try the pig tails though – yuk! Hi Barb, when we first moved to Portugal the chickens that were sold at the butchers used to come complete. I never new this until I got the first one home and Mr P had to decapitate it and remove other bits as well. I did not realsie dogs could eat raw chicken because of the bacteria? Pigs tails will def not be on the menu in the piglet residence! As long as the chicken has been kept refrigerated, the necks are safe. Been giving them to our dogs for years. I always buy frozen chickens though. You’d have to be careful buying chickens in Portugal I guess. Believe it or not, you get used to seeing these foods. Not that you have to try and eat them, but somehow after a while it’s just ordinary! I’ve lived for years all over the world, and it’s an education to see what people eat, but it’s fun too! Keep taking the pictures; they’re great. Not that we raised pigs, but we certainly used sheep’s heads to make soup! We ate brains and liver and Dad was very keen on sweetbreads. I don’t recall eating pigs ears, but the tongue of cows is delicious. Have I made you squeamish yet? Cows tongue!!! I’ve not seen that here but I think it was widely sold in the UK. I certainly could not eat brains….ewwwwwww thanks for mention on twitter by the way! This post and comments has had me crying with laughter! I can honestly say that I am glad to be a vegetarian living in Portugal. OK the choices are a bit limited on the rare occasions that we eat out but I really couldn’t stomach eating some of their dishes. I worked in a restaurant until recently and some thing really churned my stomach just to look at. For example my boss turned up with 2 huge bags of chicken feet they must have weighed a good 2kg per bag! He spent over an hour carefully trimming the nails away, then the feet were cut up into bits about 2cm and boiled. After draining and cooling they were drizzled were with olive oil and seasoned with garlic and corriander. This was served as a starter! I feel sick thinking about it! Not squeamish at all..bring it on! And when you cook those little piggy tails, they do end up looking even ruder (I know from experience)! Oh no! you’ve not really cooked and eaten them! I can imagine them standing to attention when you throw them in the stewing pot! OMG I’m also tempted to serve them as a joke for entertainment value alone! Or if they don’t eat their “befores” they won’t get any “afters”! Sounds fun though 🙂 Sorry I have a wicked sense of humour! The unidentified chicken whosits are chicken necks, which are used to make chicken stock, too gristly for us to eat, even stewed. Cats love them, dogs too! The pork whatsists freaked me out though. Also for some reason I found you lurking in my SPam. Not sure if you are having problems with this on other blogs, but that happened to me once. All mthe comments I was making on peoples blogs ended up in SPAM and I had to contact Akismet! Eeeeewwwww! Definitely better off not knowing what’s in things! We attach too much psychological baggage to what we eat. As long as it’s chemical free and was raised and slaughtered humanely, it probably tastes pretty damn good cooked right! So does my husband! I’m in the “Eat to Live” camp, while he’s definitely “Live to Eat”! This must give you nightmares considering your avatar! Shame. Yeah, just call me Ralf, as this is what these pics almost made me do. I avoid the butchery counter if I can when we go shopping and I can state up front if I knew it wouldn’t cause major up hill in our house I would be a veggie tarian amanha. My folks went vegetarian yonks ago after my dad drew my mum’s attention to a leg of lamb hanging in their local butchers in Chester. As a character in one of Pratchett’s novels said, never trust a meal that looks back at you. Certainly enough to have me running for the hills! Pork’s tails and ears are some of the things that you can find in a “Cozido à Portuguesa”, pork’s ears are also very commom as a cold appetizer on traditional restaurants as “Salada de Orelha”, pork’s head can be used for “Cabeça de Xara” an appetizer (that resembles a “terrine”). Chicken’s feet are used for “Canja de Galinha” (as are the necks, stomachs “moelas”, liver and hearts), all these things can also be found in “Arroz de Cabidela” that has an extra, chicken blood. We do eat the pork’s brains as “Mioleiras”. The most famous dish in Porto is “Tripas à moda do Porto”, it’s tripe (the cow’s intestins), it’s so famous that the Porto inhabitants are called “tripeiros”. Do you know why? The story tells that, in the XV century, all the meat was need for the ships that where battling in the north of Africa and the inhabitants had the reinvent what to do with the remains. Do I like all this? Yes. What do I think of these items? I think that they are the proof of how hard times can be and were not so long ago (not only in Portugal, because if you “dig deep” on each of your countries pass you’ll find it), and that only our supposed “rich”, “cult” and waster society makes us turn our nose to all this. I just hope that none of these things will disappear in the name of “progress”. We live in such a lucky time that is each person’s choice to eat it or not. Thank you for warning me of the various things in the different dishes I’ve often seen on the menu at the local Portuguese restaurants. You are right about poverty though and looking around me at the older Portuguese generation where I live I feel they have experienced much in their lifetime expecially those who live off the land. We have become a wasteful society and it makes me wonder how many of us would eat the unmentionalbes if we were hungry and did not know where our next meal was coming from. Or if we slaughtered a pig on our small holding and we had to use it all. PIP — I’m glad you were brave enough to whip out that camera! I’ll never look at the meat department in our supermarket the same way again!! So am I! How’s the book coming along? What do you mean…ERm…? I hope that does not mean it’s come to a grinding halt? I am now on the second draft of mine, but I’ve realised writing it all in the first preson is rather limiting. I’m wondering if I should try and rewrite one of the chapters using different peoples viewpoints and see how it compares…I’m not sure. 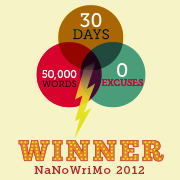 But I’ve just joined a brilliant writing forum…see my bloroll for details. You can publish extracts on there without it be published and picked up in the search engines or by non members, Pople will then critique your work…and they are good. I’m def leaning that way! My… but are we a squeamish lot!! Delicacy or not? Who cares… I don’t have to eat that… I’ll stick with the more recognisable cuts… anyone for a bit of rump?? Lamb chop or pork roast?? PS – Great post… great reaction… !! Glad you enjoyed it…we can’t take life too seriously, can we now? What a great blog you have here. The chicken parts such as the neck can be used to make stock for chicken soup. My grandparents lived through the Great Depression when many people were very hungry and if they were lucky enough to get a piece of meat, every part was used, noting wasted. The parts not eaten were used to flavor soup or given to the dogs or farm animals. Ewww these are just absolutely disgusting but great post. I think I won’t be missing meat this week. I DID IT! I ate brain curry and lived to tell the tale! OMG – you are so brave! I’m inpressed. How did you manage to swallow – or did they tell you afterwards?